Our guide to watching the Eagles in the Big Game. You can’t go anywhere in Philly this week without seeing the Eagles’ midnight green. Even if you’re not a sports fan, this is a big deal for the city, and there’s plenty of room on the Birds bandwagon. For those who haven’t been paying attention — and those who have, but want an easy reference guide — here’s the Cliff’s Notes version of everything you need to know about Super Bowl LII. The Eagles are facing the New England Patriots. The Patriots are the defending Super Bowl champions. This the second time Minneapolis has hosted the Super Bowl. It’s very cold there, but the game is indoors. Super Bowl coverage begins around noon. The actual pregame show starts at 1 p.m. with the good stuff happening mostly after 3:30 p.m.
You will see on your TV guide listing the Super Bowl as starting at 6:00 p.m., but the game itself won’t kick off until 6:30 p.m.
What network has the game? NBC has the Super Bowl this year, with Al Michaels and Cris Collinsworth calling the game from the booth and Michele Tafoya patrolling the sidelines. This is Michaels’ 10th Super Bowl, putting him one behind legendary broadcaster Pat Summerall for the most ever. In case you’re wondering, there will be five separate 60-second NBC advertisements for the Winter Olympics throughout the Super Bowl telecast, including one at halftime. Be ready to get your Pyeongchang on. Yes! You do not need a TV to watch the Super Bowl. Per NBC, you won’t even need to log in with your cable/internet provider to get the “Super Stream Sunday” service. You can use the NBC Sports app on your streaming box of choice, or stream directly via NBCSports.com here. Just be mindful, if you’re streaming the game and also following on social media, there will be a delay. Spoilers will abound. The NFL had a tough year in the patriotism department, what with people supposedly boycotting the league because of player protests during the national anthem. So to show the country just how much the NFL bleeds red, white and blue, we’re getting two songs about America before the game. Leslie Odom, Jr. — you may know him from such wonderful musicals as Hamilton and such bad NBC shows about musicals as Smash — will sing “America The Beautiful” during the pregame build up to kickoff. Odom, Jr. joins Ray Charles, Mary J. Blige, Alicia Keys, Faith Hill and Queen Latifah as artists who’ve sung this at the Super Bowl. Doylestown native Pink will then sing the National Anthem. She’s pretty excited. Justin Timberlake is tasked with handling the halftime performance. There’s already speculation he’ll cover a Prince song, what with the game being played in Minnesota (Prince’s native state). This is the second time Timberlake will appear in a Super Bowl halftime show. The last time was February 1, 2004 when he caused the Janet Jackson wardrobe malfunction seen ‘round the world. (Fun fact: Jessica Simpson, P. Diddy, Nelly and Kid Rock also appeared during that halftime show. Safe bet that group of performers won’t ever been on the same stage ever again._ The Patriots won that year over Carolina. The NBC telecast will open with Carrie Underwood’s “The Champion,” featuring Ludacris. It won’t be live. For anyone who claims the NFL ratings are down, remind them that the first Super Bowl was broadcast by two networks to “only” 50 million people. That was back when there were just three stations. Over the last eight seasons, the Super Bowl has averaged more than 110 million viewers, plus an additional million or two streaming the game online. This year’s streaming numbers should skyrocket, while the overall TV rating should fall somewhere in the 110 million range. Fun fact: Last year’s overtime game peaked at 172 million viewers, which is more than half the population of the United States. Pennsylvania native Gene Steratore will lead the officiating crew. Here’s everything you need to know about him. What should I know about the coaches? Doug Pederson is in his second season as a head coach with the Eagles. He has 22 wins and 12 losses as a head coach. He is undefeated in the playoffs. Bill Belichick is in his 23rd year as a head coach in the NFL, and his 18th with the Patriots. He has won 278 career games, losing 128. With the Patriots, Belichick is 241-83, with five Super Bowl victories. Who are the five best players on both teams? If you’re looking to bet on a possible MVP, that’s usually the quarterback, which is why Tom Brady is a huge favorite, so much that the Westgate Superbook lists him at 4-to-5, which means in order to win four dollars, you’d have to bet five. Foles is next on the list at 3-to-1 odds, with Patriots’ tight end Rob Gronkowski at 12-to-1, receiver Brandin Cooks at 18-to-1 and running back Dion Lewis at 20-to-1. Eagles running back Jay Ajayi and tight end Zach Ertz are at 25-to-1, while receivers Alshon Jeffery and Nelson Agholor, and defensive tackle Fletcher Cox are at 30-to-1. If you’re looking for the best players, it’s obviously Brady, who is the greatest quarterback to play the game and it’s hardly even a debate at this point. But the Eagles actually had more Pro Bowl players this year than the Patriots, as the Birds landed six on the Pro Bowl rosters to the Patriots’ four. Cox, Ertz, Brandon Brooks, Malcolm Jenkins, Lane Johnson and Carson Wentz all earned a spot in the Pro Bowl — held this past Sunday, so none of them played — while the Patriots had just Brady, Gronkowski, fullback James Develin and special teamer Matthew Slater. Will we see the youngest and oldest players in Super Bowl history? Tom Brady, who turned 40 in August, will become the oldest quarterback to ever play in the Super Bowl, but he’s not the oldest player. Colts kicker Matt Stover was 42 in Super Bowl XLIV. The youngest person to ever play in the Super Bowl was Jamal Lewis, who was 21 years, 155 days when he helped the Baltimore Ravens crush the Giants in Super Bowl XXXV. Bryan Bulaga was the youngest to start a Big Game, for the Packers in Super Bowl XLV at 21 years, 322 days. Why does that matter? Well, Eagles rookie Derek Barnett was born on June 25, 1996, which will make him 21 years, 224 days old when the Super Bowl kicks off. He won’t be the youngest player ever, but if he somehow sneaks into the starting lineup — he’s played in 17 games this season with zero starts — he’d set a record as the youngest ever to line up for the first snap. The opening Las Vegas line was Patriots favored by 6, but that quickly moved to 5.5 by last Monday morning. With a lot of betting coming down in favor of the Eagles to cover the point spread or win outright, the line has moved to Patriots -4.5 as of the start of Super Bowl week. 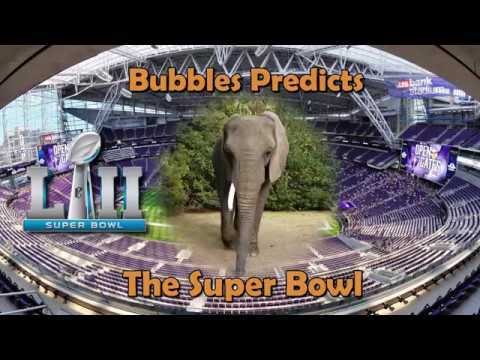 But this elephant picked the Eagles, so there you go. Who cares about the game! What time is This is Us on? Spoiler alert: Popular NBC drama This is Us gets the post Super Bowl bump this year and they’ve promised to give “a lot of answers” as to how and when Jack dies. They’ve been building up to this moment for months, ending last week’s episode with a giant fire — so bad the CrockPot company had to issue a statement — but if Jack dies in a house fire trying to save Kate’s dog, it’s an ending that feels unearned. Yes he’s the super dad that will do anything for his family, but the most compelling storyline with Jack, and one they’ve teased since the show started in relation to his death, is his struggle with alcohol. Going up in a blaze with the house because of some faulty wiring would be an emotional scene, but drama for drama’s sake. Wouldn’t falling off the wagon after losing the family home and dying in some alcohol-related incident be more true to his character and those of his adult kids? Anyway, whatever happens it’ll start as soon as the game ends and the Lombardi Trophy presentation concludes. NBC hopes that’s as close to 10 p.m. as possible.